Sometime between 1880 and 1883, a young farmer left his Italian hometown of Potenza. Giuseppe Ruoti joined the thousands of Italians emigrating to the United States. He left behind everything he knew and everyone. He spoke no English and had little money to his name. In February 1890, Maria Filomena La Rocca arrived at New York City's Castle Garden. Just shy of her 15th birthday, Maria also left behind her family and Potenza's familiarity. She spoke no English, and could not read or write. Less than a month later, Maria was in Denver and married to Giuseppe. Over the course of their nearly 30-year marriage, my 2nd great-grandparents had eleven children and built a new life for themselves in America. After discovering that Maria and Giuseppe were from Potenza, I added it to the itinerary for my already-planned Italian vacation. I had to see their hometown. I wanted to walk in my ancestors' steps. Potenza is the capital city of the comune (province) of Potenza and the larger Basilicata region in the south of Italy. The town's historic roots are situated on a hilltop that is now surrounded by sprawling growth below. Nestled in the Apennine Mountains, the air is crisp and the horizon peppered with green peaks and hills. As my train from Naples snaked its way through the Apennines, I was struck by the rugged mountain scenery and lush valleys. Colorado must have reminded Giuseppe and Maria of their homeland. What a comfort it must have been. As the train pulled into Potenza Centrale station, I was able to see the magnitude of growth. The town was now a full-fledged city with dozens of apartment buildings clustered at the base of the hill. My short visit was focused on the historic core, so I got into a taxi. The driver was a woman who was excited to have an American in her car. As she sped up the winding hilltop road, she chatted happily - in Italian. It was clear to me that Potenza was off the tourist beaten path and English was not as prevalent. The car made sharp turns down narrow alleyways that were built, I imagined, before the invention of the automobile. We stopped outside of a squat stone church. My driver jumped out of the car and opened my door. She eagerly handed me her business card. "Donna Taxi" was her company's name (literally Woman Taxi). As she pulled away, I walked up to the church. A light drizzle had started. 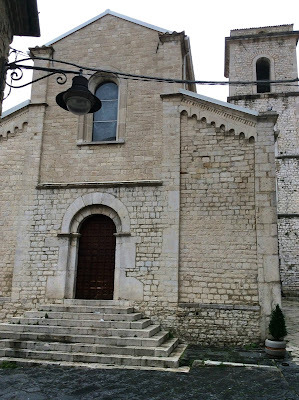 In May 1864, Giuseppe was baptized inside Chiesa di San Michele. The Normanesque building's origins date to the 12th century. It's very likely this building hosted baptisms, marriages, and funerals for generations of my Italian ancestors. Stepping inside, I passed an elderly gentleman pulling on his raincoat. He eyed me and nodded his head. The dark interior of the church was cut by light pouring in through a narrow window above the altar. I sat in a pew and eyed the church. Walking up to the altar, I placed a coin in the donation box and lit a candle. A statue of Saint Michael the Archangel kept a close eye on me with his sword raised ominously overhead. 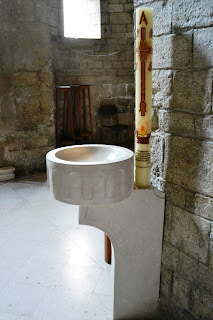 I found a small baptismal font. Was this font used for Giuseppe's baptism over 150 years ago? Quite possibly. I was struck by the church's simplicity. There were no ornate Baroque garnishes in the church. The stone and lighting made it feel cozy as though I were at home. A side aisle had a bulletin board with flyers advertising upcoming church events. I tacked a photo of Giuseppe and Maria to the board. Like a good genealogist, I wrote on the back of the picture, providing their names, that they were born in Potenza, and my name and contact information. I also noted that they lived and died in Denver, which, I later learned, is a Sister City with Potenza. Perhaps I'll hear from a distant cousin. It's difficult to describe what it's like to walk the streets where your ancestors lived. Perhaps more profound is the awe-inspiring experience of standing inside a sacred place where the most intimate moments of their lives were celebrated. Maria left 125 years ago and joined Giuseppe in search of a new state and opportunities. I returned seeking a greater understanding of them and the souls that came before. Back outside the church, the drizzle had stopped and the sun's rays began piercing the clouds. It certainly didn't feel like I was alone on this journey. Thank you, Cindy. I appreciate you visiting and commenting.